The villa, aptly named 'El Paradiso' is a large, rambling, house set on a hillside. 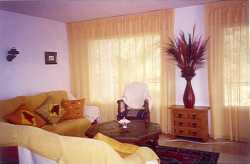 The house is extremely well equipped and can easily accommodate a party of up to 8 in 4 twin-bedded rooms. A firm favourite for family holidays, with a lovely pool and within walking distance of the beach, it is also very popular with golfing parties who return year after year to play on the local courses. It is well placed for restaurants, bars and night life whilst retaining the tranquility of being in a residential area. The villa is professionally managed with emergency help lines. Linen change and maid service once a week at nominal extra charge per person. Please bring your own towels for the beach/pool. Small fan heaters are available for the cooler months. A travel cot with bassinet and high chair are available Welcome food packs can be arranged at extra cost, as can additional maid service Living areas are upstairs, bedrooms downstairs. The spacious, well furnished lounge/dining area with wood burning stove for the cooler months, leads to large, west facing terrace with views over Elviria to sea and side terrace. Lower shaded terraces around the swimming pool (10m x 5m) have sunloungers. There is an established garden, flat at the front and terraced to the rear. Parking space for 1 car and additional available in adjoining cul-de-sac. This is a gorgeous spot and there is nothing more pleasant than just sitting on the terrace with a good book, catching the cooling afternoon breezes, followed by a quick dip in the pool. From this tranquil base you can, however, enjoy the many beaches of the Costa del Sol and all the water sports they boast. There are many renowned golf courses in the vicinity and tennis and sports clubs close by. If you want to eat out, the local beaches are dotted with good restaurants, fish and seafood being the speciality. For the more energetic, the glitzy nightlife in the resorts of Marbella, Puerto Banus, Fuengirola and Torremolinos is within easy reach. Further afield, if you like mountains, drive inland a few kilometres to enjoy breathtaking scenery or perhaps visit the impressive Moorish city of Ronda or tour the famous white washed villages of Andalucia. The caves at Nerja are spectacular, as is the city of Malaga itself. The mountains and ski resorts of the Sierra Nevada are close to Granada with all its splendour (about 2 hours drive); Seville is slightly further away. Gibraltar is visible from the coast and worth a visit. Golf Information: We have golfing parties returning to the villa year after year. 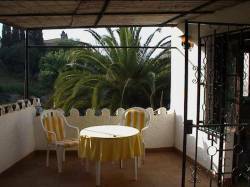 It is a great favourite, located as it is right in the heart of the prime golfing area of the Costa del Sol. Closest golf course is Santa Maria - about 10 minutes drive. Within easy reach: towards Marbella there are the courses of Greenlife, Cabopino Golf, Marbella Golf Club, Rio Real, Santa Clara and, in the other direction, Siesta, Miraflores, La Cala North and South. Alhaurin, the course designed by Seve Ballesteros, is about 35 minutes drive up into the mountains.